Newly planted palm oil trees are seen growing on the site of destroyed tropical rainforest in Indonesia. 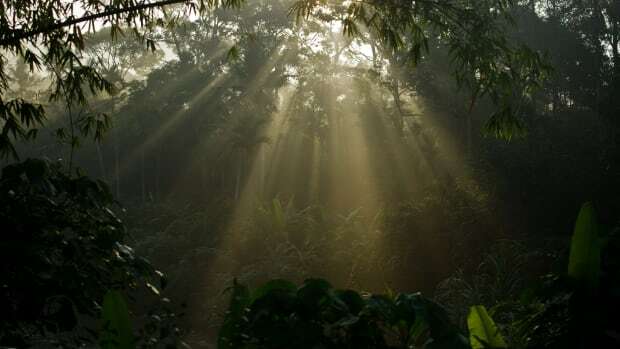 The world has just 12 years left to halve greenhouse gas emissions to prevent catastrophic climate change, but hopes that a solution will come from saving the last great tracts of tropical rainforest are dimming. Trees and soils are crucial to managing climate change; plants absorb about a third of the carbon dioxide that humans produce, while the earth takes about 10 to 15 percent. Recent estimates suggest that stopping deforestation and other "natural climate solutions" could help achieve 37 percent of the climate target needed to keep global warming below 2 degrees Celsius (3.6 degrees Fahrenheit). Combined with a rapid phase-out of fossil fuel, this could be enough to limit warming to 1.5 degrees. That&apos;s the threshold beyond which a recent United Nations Intergovernmental Panel on Climate Change report warns that massive and destabilizing climate events will be inevitable. But the current climate commitments of the countries with the richest swaths of rainforest indicate they will continue to clear trees, undermining one of the best available solutions to staving off climate change impacts. A new report by the Rainforest Foundation Norway, a non-governmental organization, dissects the climate plans of six tropical countries, known as Nationally Determined Contributions, or NDCs, which spell out the actions they countries intend to take to address climate change, in a bid to project what will happen with their forests. The countries studied were chosen because they are home to the last large intact spans of rainforest in the world: Brazil, Indonesia, the Democratic Republic of Congo, Colombia, Peru, and Myanmar. The key takeaway from the RFN study: None of the countries analyzed plan to end deforestation. Even if their climate targets are met, in terms of reduced carbon emissions, they will continue to deforest; in some of the countries, the rate of deforestation is even likely to increase. "We need these countries to realize what kind of responsibilities they have and change their course," said RFN policy adviser Torbjørn Gjefsen. "Forests are a huge natural resource that can bring a lot of benefits, but if they keep exploiting it in the way they&apos;re doing now, it will lead to catastrophic climate change for all of us." Gjefsen was speaking at the U.N. climate summit currently taking place in Katowice, Poland, less than a month after a biodiversity summit in Sharm el-Sheikh, Egypt. The two issues are intricately linked, he said, and reducing carbon emissions will hinge to some degree on keeping forests, and the biodiversity they host, intact. "There&apos;s an interconnection between the two," he said. "Carbon-rich rainforests are able to sustain more biodiversity, and the biodiversity helps keep the rainforests intact. So if you lose either one, they&apos;re both gone." With such a powerful climate tool at their disposal, tropical countries play a critical role in determining whether humanity can limit global warming to 1.5 degrees or not, Gjefsen said. "It shows that it&apos;s actually possible to reach the 1.5 degrees target by [stopping deforestation] and cutting fossil fuel emissions rapidly," he said. "And then avoiding having to use technology that we don&apos;t know yet whether it&apos;s going to work, like direct carbon removal and carbon storage, which is going to require a huge amount of land." Most of the countries studied for the RFN report have made zero-deforestation commitments—but not within the scope of their NDCs. Indonesia, the DRC, Peru, and Colombia have signed the New York Declaration on Forests, which aims to halve the rate of deforestation by 2020, end it by 2030, and restore hundreds of millions of hectares of degraded land. The total area of land proposed for restoration under the scheme—which, crucially, is voluntary and not legally binding—is described as covering "an area larger than India." 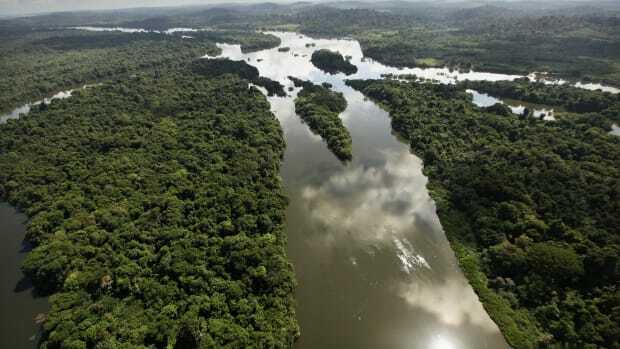 Brazil, home to the largest expanse of rainforest on the planet, has refused to sign up to the declaration, saying it might potentially contravene its national laws. It has, however, announced its own plan for zero illegal deforestation by 2030 and the restoration of 46,330 square miles of rainforest, an area the size of Pennsylvania. 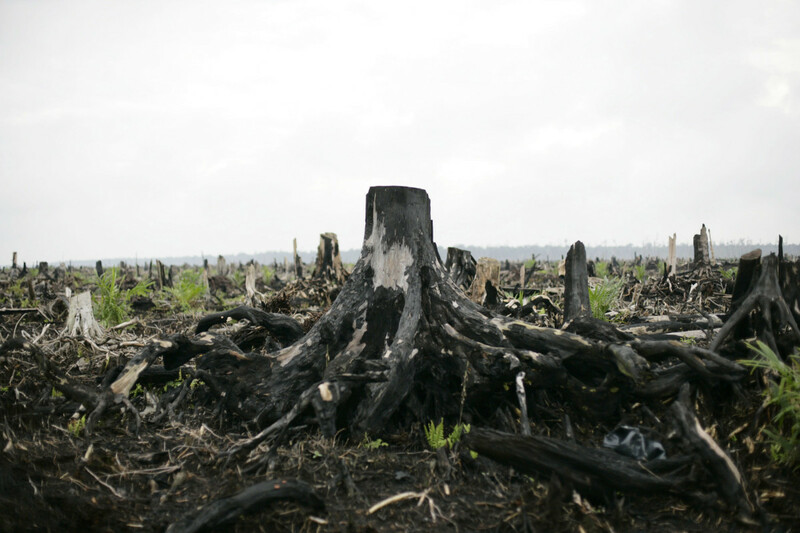 Yet despite these pledges on tackling deforestation, no such commitments have made it into the six countries&apos; NDCs, according to the RFN researchers. While Indonesia has no zero-deforestation plans in its NDCs, it&apos;s the only one of the six countries that has a plan to reduce its deforestation rate, from the current 1,850 square miles per year to 1,250 square miles per year by 2020. "But it&apos;s still not in line to reach the 1.5 degrees target" by 2030, Gjefsen said. And if Indonesia does achieve its stated reduced deforestation rate, then by 2030 it will have cleared 12,500 square miles of rainforests. "It is an area the size of Belgium," Gjefsen said. "Not really a big country, but still it&apos;s a lot of forest loss." The country&apos;s emissions reduction target for its forestry sector, set at 217 million tons of CO2 in 2030, would mark a reduction of 70 percent compared to the 714 million tons of CO2 that will be emitted if the country sticks to the business-as-usual approach. That means there&apos;s very little wiggle room for the forestry sector to further reduce its emissions without sacrificing economic development, said Nur Masripatin, Indonesia&apos;s chief negotiator at the U.N. climate talks. "Meanwhile, the energy sector still has a lot of room" for reducing emissions, Nur said. "That&apos;s why we&apos;re hoping for the energy sector to increase its [targets]." With Indonesia not planning to dramatically cut its deforestation rate, much less shift to zero deforestation, Gjefsen said the government would have to achieve a large proportion of its forestry emissions reduction target by planting trees, or reforestation. In its NDCs, Indonesia projects restoring vegetative cover on 46,330 square miles of currently unproductive land by 2030. Crucially, though, the NDCs simply use the generic term "plantations," leaving it unclear whether this will be a genuine reforestation effort or the land will simply be turned into more monocrop estates. The government has long baffled the international community by counting plantations of oil palms and other monocrops as part of its forest cover. "One of the big questions is what kind of restoration is it actually going to be?" Gjefsen said. "On what type of lands? Is it going to be an establishment of plantation on peat? Then it&apos;s going to be a big issue because it&apos;s not going to be any mitigation at all. It&apos;s going to be an increase in emissions." He added he was concerned that the true figures for deforestation would be fudged by the spread of plantations. "That means that deforestation in Papua, which will be the last intact rainforests, could be ... offset by regrowth in other parts" of the country, he said. "From a climate perspective, that&apos;s really important because it looks like it&apos;s the same—you lose some forests, you gain some—but their carbon storage is vastly different." Plantation trees like oil palms typically have 70 percent less carbon storage than natural rainforest trees. Nur said the RFN&apos;s conclusions about Indonesia were flawed because they failed to account for the progress already made toward the country&apos;s emissions reduction target. "We have monitoring devices to track our progress and to know whether we&apos;re on the right track or not," she said. "And we&apos;ve managed to reduce our emissions compared to our business-as-usual level, even though we still have to reduce more in order to achieve our target of 29 percent emissions reduction by 2030." Anggalia Putri Permatasari, from the Indonesian environmental non-governmental organization Yayasan Madani Berkelanjutan, said the government had indeed taken measures to curb deforestation, including issuing a moratorium on new permits to clear primary and peat forests, as well as a moratorium on oil palm permits. 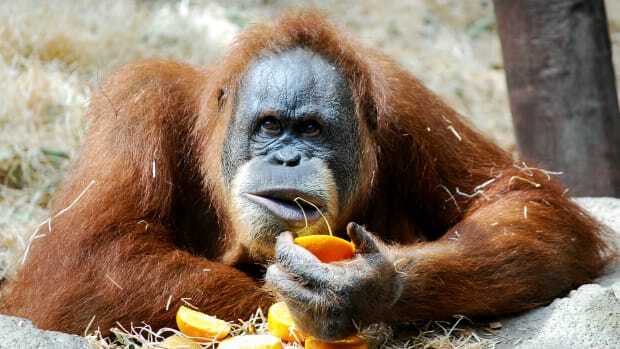 "The palm oil moratorium is very promising because it promises to evaluate all palm oil licenses," she said. The Indonesia Forum for the Environment (Walhi), the country&apos;s biggest green watchdog, called on the government to at least address the IPCC report warning that the world had only until 2030 to cut global carbon emissions by half to prevent catastrophic global warming with its far-reaching impacts on populations, food supplies, and natural systems. "The government has to take urgent steps to push the global temperature below 1.5 degrees to ensure people&apos;s safety," Walhi said in a press statement. As one of the biggest carbon emitters in the world, it went on, Indonesia should take steps to strengthen and extend the existing moratoriums, and carry out an environmental audit of companies in the forestry and plantations sectors. In Brazil, the deforestation rate is expected to remain the same through 2030, according to the RFN&apos;s study of the country&apos;s NDCs. Brazil plans to reduce 72 percent of emissions from deforestation by 2025 and 92 percent by 2030 compared to 2005 levels. But the country&apos;s deforestation rate in 2005 was inordinately high, meaning the target won&apos;t translate into a substantial reduction in deforestation. "So the reduction on paper looks really good, but if you compare that with deforestation today, it&apos;s pretty much the same," Gjefsen said. He added things might only get worse from now. Brazil last month reported a preliminary 13.7 percent rise in deforestation from August of 2017 to July of 2018. It was the highest level in a decade, representing a 41 percent shortfall on the official deforestation target and the fourth consecutive year it&apos;s missed the target. The high rate of deforestation, while bucking a long-term trend of declining rates of forest loss in the Brazilian Amazon, had been widely expected due to economic and political conditions in the country, as well as the ongoing trade war between the United States and China, which has increased the profitability of Brazilian agricultural products. The election of Jair Bolsonaro as the country&apos;s new president has also raised further concerns over the future of the Amazon. The president-elect has been sharply critical of environmentalists and threatened to withdraw Brazil from the Paris Climate Agreement. He has also called for ending environmental fines for companies, spurring fears among activists that the pace of deforestation will increase. Bolsonaro has also rescinded Brazil&apos;s offer to host next year&apos;s U.N. climate summit, saying foreign involvement in the Amazon threatens the country&apos;s sovereignty. 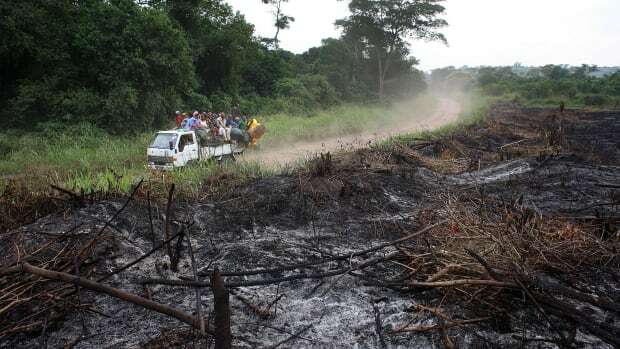 "With the incoming government in Brazil, it&apos;s going to be pretty hard enough to keep the level of deforestation at today&apos;s level," Gjefsen said. "[Bolsonaro] has said a lot of bad things about climate change and indigenous people&apos;s rights." The NDCs of Peru and the DRC suggest both countries will likely increase their rates of deforestation and emissions from deforestation, even while keeping within their overall emissions reduction commitments, according to the RFN. Both countries project their emissions from their land-use and forestry sectors to significantly increase in the future under the business-as-usual scenario: a doubling, in the case of the DRC from 2010 to 2030, and a 70 percent increase for Peru in the same period. As a result, both countries can still see an increase in deforestation yet still tout a reduction in forestry emissions when compared to the business-as-usual scenarios. "It looks like they&apos;re going to do a lot but it&apos;s still an increase in forestry emissions," Gjefsen said. The NDCs for Colombia and Myanmar, meanwhile, don&apos;t provide enough detail to assess the expected emissions from forests, the RFN said. Gjefsen said he was well aware it wouldn&apos;t be easy for any of the six countries to attain zero deforestation by 2030. But he said they could still ramp up their efforts to reduce forestry emissions and slash deforestation by much more than what they&apos;ve pledged in the NDCs. "We need to restore degraded forests and peatland, and expand the coverage of natural forests," Gjefsen said. "And we need to increase the land rights of indigenous peoples so that the carbon stored in their indigenous homes will be safer and face less threats from the outside." And meeting the 2030 target will require transformational change in land use policies globally, as well as a change in agriculture practices and diets. Doing so can sequester 22 gigatons of CO2 per year, representing 40 percent of current global emissions. "Obviously this is very ambitious and represents a radical shift from where we are today," Gjefsen said. "But it is absolutely vital to stop the catastrophic climate impacts." While geographer Alan Grainger has upset conventional wisdom by suggesting the world's tropical forests are not shrinking, he sees his research as a clarion call.